N2664I at Seattle / Boeing Field, Washington. • 55-3285 United States Army. Delivered 28-Jun-1956. Sep-1962. Assigned to 394th Transportation Battalion, Nettingen, Germany. Jun-1964: Returned to USA possibly to Army Aeronautical Depot Maintenance Center (ARADMAC), Corpus Christi, TX. Jun-1965. Assigned to the Da Nang platoon of the 18th Aviation Company. Dec-1965.Transferred to the 54th Aviation Company, attached to the Headquarters Section, based at Vung Tau. Assigned to the 44th Medical Brigade. Apr-1966 returned to US with the Army Aeronautical Depot Maintenance Center (ARADMAC), Corpus Christi, TX. Jun-1966. Returned to Vietnam with the 18th Aviation Co.
Mar-1970. 79th Transportation Company at Qui Nhon, who prepared it for shipment home. Jun-1970. Red River Army Depot, Texas. 21-Jul-1971. 12th Aviation Company, Fort Wainright, Fairbanks, AK. Accident: Between Fort Greely and Fort Wainright. 29-Aug-1972. The aircraft suffered engine failure. After take-off, the engine ran rough. The fuel selector was switched to another tank but the engine continued to run rough, with the propeller losing RPM. An emergency air start was attempted. The pilot noticed the chip detector light was on, and smoke was entering the cockpit. An emergency landing was attempted in extremely rough tundra-type terrain, striking small trees and ending up in a bog. Fortunately, none of the occupants was injured. Considered as a total loss, retrieved from its resting place and put up for sale. • N26641 Harold J. Hansen, Boeing Field, Seattle, WA. Regd circa Aug-1973. • N26641 Robert G. Sholton, Anchorage, AK. (A founder of Northern Air Cargo). • N26641 Buck Maxon, dba Maxon Aviation, Kotzebue, AK. Regd 04-May-1977 Canx 30-May-1981. Accident: Nth of Kotzebue. 23rd June 1976. En route back to its base at Kotzebue the aircraft had been flown using the rear fuel tank for two hours. Fuel starvation occurred and the pilot attempted to land on a small gravel bar in a river north of Kotzebue, but ended up in the water turning turtle and settling into an upside down position. After an extended retrieval process the aircraft returned to service. Accident: Near Kotzebue, AK. 22nd July 1978 The aircraft had departed Kotzebue on a flight to the Red Dog Mine. Weather conditions were conducive to carburettor / induction system icing, which led to a partial loss of power. The pilot attempted a landing off airport on land near Kotzebue but fog obscured visibility and the aircraft impacted the ground. There were no injuries, but the aircraft was consumed by a post-impact fire. Otter 134 was delivered to the United States Army on 28th June 1956 with serial 55-3285 (tail number 53285). It was assigned to the 2nd Aviation Company, Fort Riley, Kansas which later deployed to Germany, then France (as described in relation to Otter 124). By January 1962 it was at the Depot at Coleman Barracks, Mannheim, Germany as a maintenance float and in September 1962 was assigned to the 394th Transportation Battalion. It left Europe in June 1964 and was transported back to the United States and then onwards to Vietnam, where it joined the 18th Aviation Company. It was assigned to the Da Nang platoon of the 18th Aviation Company in June 1965, replacing 81697 which had crashed. In December 1965 it was transferred to the 54th Aviation Company, attached to the Headquarters Section, based at Vung Tau. It was assigned to the 44th Medical Brigade, which had responsibility for all hospital and medical evacuation helicopter detachments. The Otter, callsign “Medicare 285”, flew courier missions up country to units near the DMZ. It would fly north, stopping at the various medical units, and for the return would climb up to 9,500 feet and fly feet wet non-stop back to Vung Tau, a three hour flight. The Otter returned to the United States in April 1966 for overhaul at the ARADMAC Depot, Corpus Christi, Texas and then went back to Vietnam, joining the 18th Aviation Company in June '66, where it served until March 1970 when it went to the 79th Transportation Company at Qui Nhon, who prepared it for shipment home. It arrived at the Red River Army Depot, Texas in June 1970, where it was overhauled and prepared for its next assignment, to the 12th Aviation Company, Fort Wainright, Alaska. Curt Brown, then serving with the 12th Aviation Company, and who by coincidence had flown 53285 when it was based at Vung Tau, was sent to collect the Otter and fly it back to Alaska. He recalls departing Fairbanks at midnight on 6th July 1971 on a Pan Am flight to Seattle, then by Braniff to Love Field, Dallas, Texas, arriving at 11am, and then by Trans Texas Airlines Convair 240 to Temple, Texas and finally by hired car to Fort Hood. The Red River Army Depot was part of Fort Hood and some test flights were performed on the Otter before it was accepted, snag rectification delaying the departure for some days. The mammoth ferry flight commenced on Monday, 11th July 1971, the first sector being to Tinker AFB, Oklahoma, the crew comprising pilot, co-pilot and crew chief. Upon landing at Tinker, the Otter veered off the runway due to a malfunctioning tail wheel motor. This resulted in a few days delay, until the Air Force maintenance control fixed the motor. The following Saturday morning, 16th July, 53285 resumed its ferry flight, arriving that evening at Casper, Wyoming where the crew RONed (remained overnight). Sunday they flew to Great Falls, Montana, had lunch and refuelled and continued on to the Edmonton International Airport and then to the Canadian Armed Forces base at Namao. Here 53285 received a 25 hour inspection with assistance from Canadian personnel, Namao being at the time home of 418 Squadron's Otters. Tuesday 19th July saw the continuation of the flight, next stop Fort Nelson for another RON. Fort Nelson is the first big town up the Alaska Highway, some 300 miles from Dawson Creek. This part of the flight was all day VFR, following the highway, on account of the many usable emergency landing strips left over from the second World War. The next day saw 53285 flying from Fort Nelson to Whitehorse in the Yukon, another 600 miles up the highway. Whitehorse was another RON and fuel stop. The delivery flight was completed the following day, routing from Whitehorse to Northway, Alaska to clear customs and arriving at Fort Wainright near Fairbanks around 18:30 hours. At Fort Wainright the Otter joined the 12th Aviation Company, where it was to serve for just over a year. On 29th August 1972, 53285 was returning from Fort Greely to Fort Wainright when it suffered engine failure. After take-off, the engine ran rough. The fuel selector was switched to another tank but the engine continued to run rough, with the propeller losing RPM. An emergency air start was attempted. The pilot noticed the chip detector light was on, and smoke was entering the cockpit. An emergency landing was attempted in extremely rough tundra-type terrain, striking small trees and ending up in a bog. Fortunately, none of the occupants was injured. In less than five minutes an Army OV-1 Mohawk of the 12th Aviation Company was overhead and began co-ordinating with the Air Force rescue helicopter to pick up the downed crew. As far as the Army was concerned, after that accident, the Otter was a “total loss”. 53285 was retrieved from the bog and put up for sale in its damaged condition. The “wreck” was purchased by that skilled Otter rebuilder Harold J. Hansen, who trucked the aircraft down to his facility at Boeing Field, Seattle and started work. 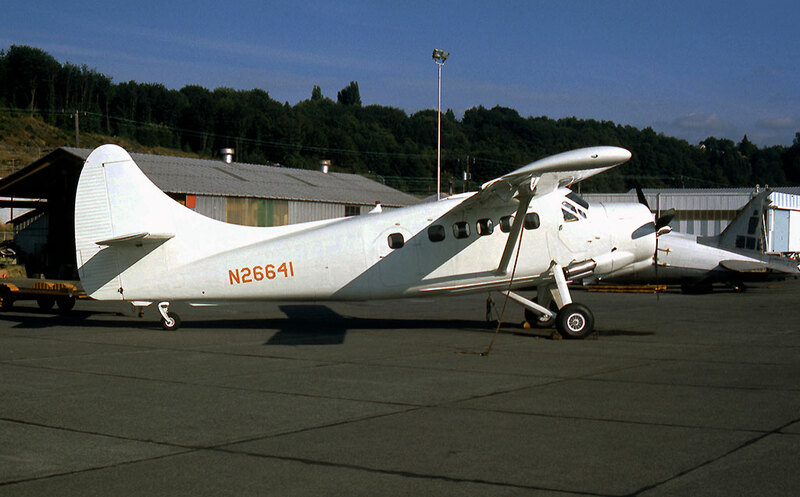 As it neared completion, the Otter was registered to him as N26641, and was noted at Boeing Field in August '73 rebuilt and painted all white. It was then sold to Robert G. Sholton of Anchorage, one of the founders of Northern Air Cargo, and then sold on to Buck Maxon, who ran a charter service known as Maxon Aviation, based at Kotzebue, Alaska. It entered service with Maxon Aviation and continued flying for that company until it suffered another accident on 23rd June 1976. N26641 was en route back to its base at Kotzebue and had been flown using the rear fuel tank for two hours. Fuel starvation occurred and the pilot attempted to land on a small gravel bar in a river north of Kotzebue, but ended up in the water. As the Accident Report found: “Failed to follow approved procedures; mis-management of fuel”. The Otter was retrieved from the river by Wesley (Kip) Kippinham, considered by many to be the premier aircraft wreck retriever of his day. Dave Stern worked with him on this project, and takes up the story: “The Otter had crash landed in a fast moving river, roughly 150 miles north of Kotzebue. Upon turning turtle and settling into an upside down position, steady thundershowers caused this particular river to rise. The result was a ton plus of indigenous grey flour-like silt being deposited into every nook and cranny of the Otter, from nose to tail. Filling the ceiling, wings, tail and other crevices, the glacier silt quickly dried to rock hard consistency”. “When Kip arrived at the crash site, he examined a severely overweight Otter that could not be pulled back onto its landing gear with so much wet silt inside. The rugged Otter consists of original factory skins ranging from .016 thousands around the tail unit to .025 up forward and wings utilizing some .025 thousands aluminium, making certain areas of the aircraft quite delicate. Kip worked as fast as he could to remove the silt before righting the bird but spent far too much time and physical effort on the hard packed silt. There was a long list of sheet metal work and an engine and propeller change plus many other matters that needed attention”. “Lacking some material to cushion the impact of the tail wheel supporting an extra heavy fuselage, the Otter upon being turned over with ropes and come-alongs, slammed into the water, ramming the tail wheel and its mount up into the rear fuselage. Kip finally flew into Kotzebue and explained about his lack of headway with this recovery and the valuable time wasted in cleaning out the aircraft plus the tail wheel damage. Kip relinquished the salvage project, leaving Buck Maxon to fly in and remove more silt, and repair the motor mount. Lacking time and equipment, he merely flushed out the contaminated engine and hung a new propeller. He left the upper and lower engine cowlings off, and simply wired the carburettor intake box to the engine, just as high winds began racing through the area. Buck flew the wreck to Fairbanks, but while in flight, the engine slowly burned increasing amounts of oil. During that flight, the remaining river silt literally ground up cylinder walls, rings, valves and engine bearings, as he winged his way to Fairbanks, before flying south to Seattle”. “When Buck Maxon arrived at Rico's Foreign & Domestic Aircraft Repair Shop at Boeing Field, Seattle the engine was described as pumping raw oil out the exhaust stacks and overboard. The lower port fuselage was streaked with dirt encrusted oil. Throughout their flying careers, most aircraft slowly gain a few pounds from dust, dirt and debris. In this case N26641 definitely gained more than several hundred pounds, simply because there still lurked in hidden cracks and crevices large amounts of Alaska glacier silt that was next to impossible to remove unless the plane was completely dismantled to the smallest sheet metal component”. Following its rebuild, N26641 returned to Kotzebue and re-entered service with Maxon Aviation. What was to be its final mishap occurred on 22nd July 1978. The Otter had departed Kotzebue on a flight to the Red Dog Mine. Weather conditions were conducive to carburettor/induction system icing, which led to a partial loss of power. The pilot attempted a landing off airport on land near Kotzebue but fog obscured visibility and the aircraft impacted the ground. There were no injuries, but N26641 was consumed by a post-impact fire.